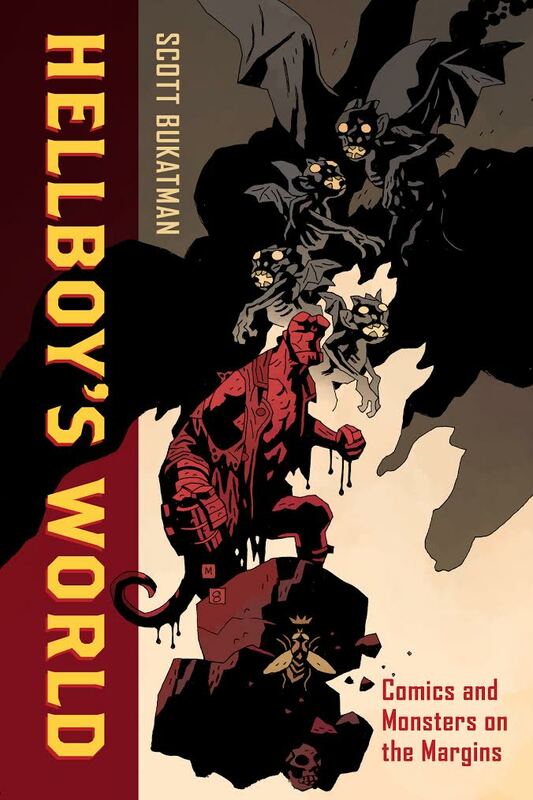 Review Fix chats with “Hellboy’s World” author Scott Bukatman, who discusses his new book and the impact Hellboy creator Mike Mignola has had on the comic book industry. Scott Bukatman is Professor of Film and Media Studies in the Department of Art and Art History at Stanford University. He is the author of Matters of Gravity: Special Effects and Supermen in the 20th Century; Blade Runner, BFI Modern Classics; Terminal Identity: The Virtual Subject in Postmodern Science Fiction; and The Poetics of Slumberland: Animated Spirits and the Animating Spirit. Scott Bukatman: I had a semester off from teaching and not much to do, so I was reading a lot of comics. I’d heard that BPRD (by Mike Mignola, John Arcudi, and Guy Davis) was an amazing ongoing series, so I checked it out. Meanwhile, Dark Horse was reprinting Hellboy in large-format “Library” editions, and those just blew me away. I’d read Hellboy in the early years, but didn’t fully get it back then. And I knew the Hellboy films but didn’t particularly like them (the first one’s not bad, though). But now I was loving the comics and I began to think more about what the Hellboy comics had that the films didn’t, and I kept coming back to Mignola’s approach to comics: his aesthetic, his commitment, his collaborations. After many years of writing about comics and film as moving image media, I began to appreciate the deep differences between these media. Mignola’s work is so still on the page — the doesn’t use motion lines or the other cues that comics use to indicate movement (and keep things moving), it seemed to work entirely differently from the kinesis of the movies. I began to think about what it is to read comics: what we do when we read them, how we derive pleasure from them, what makes them unique as a medium. And I thought that this would be a good thing to write about, using Hellboy as both a case study and as something wonderful in its own right. Review Fix: What makes the Hellboy Universe so unique? Bukatman: First, the fact that it’s the creation of one person who has continued to oversee its development. Mignola owns Hellboy, and can do with it whatever the hell (ha) he wants. But he not only writes and draws comics, he also writes for other artists, and co-writes and co-plots still other titles. I was suspicious of the collaborations — I figured Mignola was just phoning it into this Dark Horse cash cow. WRONG. I think he’s as good at collaborating as he is as a solo creator (it’s hard for me to think of anyone else I’d say this about). The universe that he’s created (now THERE’S an interesting phrase) has continued to expand, but it ultimately remains under the control of one person with his own sensibility and aesthetic. This is SO different from the corporate-controlled world of superhero comics/events/properties/franchises/merchandise… it’s really refreshing. Review Fix: What originally attracted you to Mike Mignola’s work? Bukatman: First, the gorgeous art. Second, the rich plotting. Third, the comparatively minimal dialog. Ultimately I love how Hellboy and its offshoot titles highlight the art, by Mignola and so many others, in every way possible. And then I began to realize that it wasn’t just one beautiful page, but two pages next to one another — Hellboy is meant for print (“Ultimately, it’s the book,” Mignola told me), it’s meant to be held in the hand as a book with real weight, lustrous paper, and two pages at a time. When I realized that Hellboy’s “world” is actually the book, I knew I had something worth pursuing. Review Fix: What did you learn about yourself by writing this book? Bukatman: I had a lot of fun trying to find new ways to understand comics. Once the comparison to cinema goes away, what’s left? I found myself researching sculpture, children’s books, illuminated manuscripts, literary world-building, and genre histories. Comics is a hybrid medium, and it demands a kind of hybridized scholarship. This was also the first book I wrote that wasn’t designed to get me either tenure or promotion, and I felt very free to write more accessibly, to have more fun. I’ve never written as easily or as happily as I did working on Hellboy’s World. Review Fix: Where do you think he stacks up with some of the greats in the industry? Bukatman: Waaaaay up there. In some ways, I can compare him to Jack Kirby, in other ways I can compare him to Chris Ware. His work is very sophisticated but at the same time very approachable. And his absolute dedication to this wonderful medium continually shines through.